Motorola will launch the Moto G 3rd Gen very soon, but before that looks like rumors and leaks are just not lagging behind the brand. There were rumors about customization services that Motorola will provide to Moto G 3rd Gen users and accidentally, the Moto Maker page dedicated to Moto G 3rd Gen was leaked on the Motorola Website. 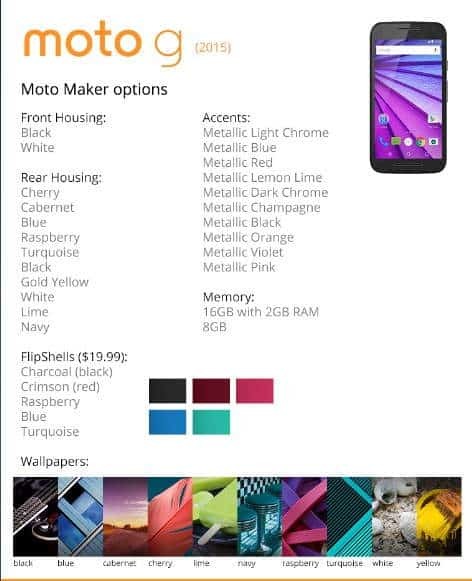 According to this leak, Motorola is officially calling the phone as the Moto G (2015) instead of the Moto G 3rd Gen, well that’s kinda change I guess no one had expected, not even me. The phone will have Moto Maker options that include white or black fronts, at least 10 back housing colors, and another 10 accent colors. Also, there are memory based variants as well which will let users choose between an 8GB model (with 1GB RAM probably) or a 16GB model with 2GB RAM. Just like other Moto Maker products, users will also be able to choose custom wallpapers according to their wish. And here is the info that Motorola posted, you can clearly see all the details in the screenshot that we captured below. The page was hosted on the Motorola US website, but was pulled down very soon. So, I guess you can’t access any other details right now. But don’t worry, we will keep you updated. Just join us on Facebook to get the latest updates on the topic, no matter where you are, because it will help us serve you better and tailor stories based upon the interest of our readers. Have a good day.